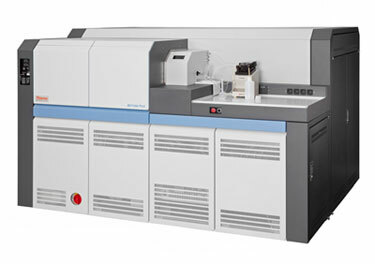 The Wyoming High Precision Isotope Laboratory includes a state-of-the-art Thermo Fisher Scientific NEPTUNE Plus MC-ICPMS and supporting clean lab. The capabilities of the Neptune Plus allow for high mass resolution and high precision isotope ratio measurement, allowing for groundbreaking research in earth systems science. MC-ICPMS has forever changed mass spectrometry; namely, MC-ICPMS dramatically increased the precision of isotopic measurements for elements with high first ionization potentials– Th, Hf, W and Pb, while significantly reducing analysis time for all isotopic measurements. MC-ICPMS has also opened up exploration of the periodic table leading to the discovery of small, but significant, natural isotopic variations in a number of elements, which were previously difficult or even impossible to analyze. Our new NEPTUNE Plus is a next-generation MC-ICPMS and is indisputably the most sensitive and stable multi-collector ICPMS the industry has ever created. Our particular machine has what ThermoFisher calls one of the most sophisticated collector block ever built. In addition to the nine standard movable faraday collectors, this machine has eight ion counters with two of these ion counters having high abundance sensitivity filters in front of them. This collector array provides a unique capability for measuring low-level U-Th-Pb isotopes (simultaneously) and Ra isotopes. The NEPTUNE Plus MC-ICPMS is intended as a multi-user instrument to provide state-of-the-art isotope data for academic scientists from across the globe. The instrument and the supporting clean lab spaces are sophisticated and vulnerable to misuse and require explicit user training. All users must show a certain level of analytical prowess and fastidious diligence to have unsupervised access to either the instrument or the labs. Operations for this facility are self-supporting and so machine time costs reflect realistic operations costs. Initial funding came from two sources: the US National Science Foundation (EAR) funded the machine in its entirety and the University of Wyoming supported room renovation costs. Therefore, non-federal or non-Wyoming state-supported projects are billed at a rate of $1200 / 12 hour run day. Federal or Wyoming state funded projects are provided a discounted rate of $1000/ 12 hour run day. Educating the next generation of isotope geochemists is an important goal of our facility, so it is expected that users and their students will be actively involved in the analyses and learning of MC-ICPMS metrics. This facility is intended to support the development of graduate and undergraduate students in the quantitative aspects of Earth Sciences.